Anyone who grew up watching Popeye eating mounds of spinach knows that iron is one of the essential nutrients. Most people also think that spinach is a pretty good source of this nutrient as a result of this popular cartoon. The truth is that early in this century, when scientists were testing for the iron content of spinach, long before automated printers, they wrote down the wrong results. Someone put the decimal point in the wrong place and for a long time people believed that spinach contained 10 times more iron than it really did. Spinach does contain some iron, but it isn’t the best source. Red meat is the best source, so maybe Wimpy, with his love of hamburgers, should have been the one fighting Bluto for the love of Olive Oyle. Iron is also found in oily fish, the dark meat of chicken and turkey and in some nuts, seeds, dried fruits, dark green vegetables and fortified breakfast cereals. Due to Popeye’s antics, most people also believe that iron can actually make you stronger. That’s not strictly true, but it is half right. Iron deficiency or anaemia makes you feel weak and lethargic but increasing your iron intake only makes you stronger if you have had a deficiency in the first place. It gets you back to normal, so to speak. Iron is needed for haemoglobin (the red pigment in blood) to work properly and carry oxygen to all the body's cells. One of the first signs of low iron intake is tiredness and fatigue. Women and young girls who eat little meat, poultry and fish or who are completely vegetarian are particularly at risk of running down the body's iron reserves, and experiencing symptoms of deficiency. Low iron levels can have a serious effect on many aspects of normal daily functions, including an ability to concentrate. Other groups are also particularly at risk. These include pregnant women and older people, who may need to take extra care. During pregnancy, if iron stores are already low, the increased demands made by the rapidly growing baby in the last six months of pregnancy may tip the balance and throw the expectant mother into a deficient state, adversely affecting the growth of the infant's brain. Older people can suffer through poor diets combined with an ageing digestive tract that finds it harder to absorb the iron that is present in foods. 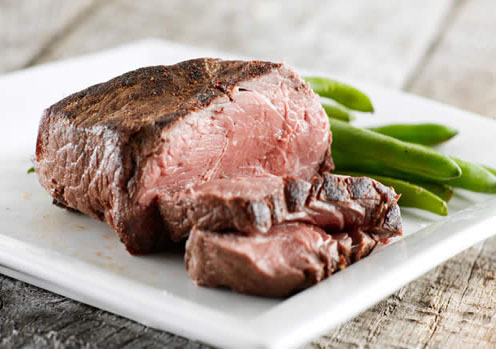 - If you eat meat, try to include some lean, red meat in your diet every week. - Breakfast cereals are often fortified with iron so they make a great breakfast or snack. Adding dried fruit like raisins, dates or figs will also boost your iron intake. - Peas, beans and lentils are good sources of iron and ideal for soups and casseroles. Something as simple as baked beans on toast is quick, nutritious and tasty. - Eggs are high in iron as well as very versatile for any time of the day - poached on toast for breakfast, in sandwiches for lunch or as an omelette with your favourite filling for dinner. - Dark green vegetables like spinach, kale or broccoli are vegetarian-friendly iron-rich foods but remember, you need to eat plenty of these to get enough of the nutrient. - Eating foods rich in vitamin C, like citrus fruits, and vegetables like peppers and tomatoes at the same time as iron rich foods will help you to absorb the iron in other foods. For example, have salad in your egg sandwiches or a piece of fruit afterwards. Iron absorption is lowered when eaten with certain foods. Avoid taking iron rich foods at the same time as drinking tea. Foods that are high in bran may also interfere with absorption.